The Mechanical Heart was stored and would be developed in heavy security deep within the Clockwork City. He stored it within the Chamber of Lorkhan, located deep in the Clockwork City's Cogitum Centralis. The Cogitum Centalis contained an automated defense system controlled by a master factotum. 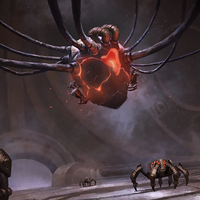 In the Mechanical Heart's early stages of development, it proved to be dangerously unstable, and Sotha Sil devised a plan to contain it as it threatened to destroy the entirety of his Clockwork City. With the creation of his own variant of Kagrenac's Tools, he was able to control the heart, and even shape or dismantle it if necessary. His plans would be rushed, as in 3E 427, the goddess Almalexia, having been driven mad by her loss of immortality, manipulated the Nerevarine to retrieve Barilzar's Mazed Band, which she used to travel to the Clockwork City to murder Sotha Sil in cold blood. He knew that one day his friend Almalexia may come to kill him, and in his final moments, attempted to ensure that his City would live on after his death. He was successful in sealing the Heart within the Chamber of Lorkhan, and his machines began finishing the construction of the the Heart within it. The Mechanical Heart was completed in 4E 200, approximately 649 years after it was first conceived and 207 years after Sotha Sil's death. Sotha Sil's creations previously required his presence, with the city's functions going into a slumbering mode in his absence. His presence was no longer needed as the heart continued to power the city and sustain its inhabitants even after his demise. The Heart also allowed the realm to find new life, as the city had been overrun with vibrant flora, with vines covering the clockwork architecture and various plant life even piercing out of various buildings in the city's landscape, possibly making the Everwound Wellspring obsolete. This page was last modified on 2 March 2019, at 23:23.